UTD beat spurs 2-1 first game of the season. Put some offered for you players mate. Also, AC Milan randomly put some bid, please do get back at me. Well we drew our first game 0-0 in a tight affair against AS Monaco, fair result all in all so nothing to say there really other than the fact Fischer completed the first 60 minutes of the season. On the transfer front we agreed our 3rd deal tonight so will have completed the 3 transfers come the morning. The first one saw Sanchez travel to Barcelona with Mata & Rodriguez coming to Dortmund. That was followed up by the signing of Martinez from FC Porto which saw Lovren & Reinartz sign for the Portuguese club. Tonight we agreed the last deal which will see long term target Strootman sign for Dortmund but we are sad to see Gundogan sign for AC Milan. We still have Monreal, Adriano & Inler available for transfer whilst would also like to do something about a new striker with Torres being available in a 2 for 1 deal with any of the 3 mentioned above. Happy to have completed the forced deals for the season. Also dropped Benteke and Perisic for cash, as I can't offer them any minutes the approaching season. Still interested in doing deals though, mainly looking for a defender to replace Barzagli long term. Just drop me a pm if you see a deal. Everyone can go. The match ended 3 - 3 between Tottenham Hotspur and Liverpool in a thrilling Division 2 encounter. Jones, Young and Kane were amongst the goalscorers. FC Schalke 04 slumped to a 3 - 2 defeat to Borussia Dortmund in their Division 3 fixture. Nasri was on the scoresheet for his side. to win against SSC Napoli last night, score 2:1 on Stadio San Paolo in Naples. A match dominated by the Germans, who had 56% possession and 7 chances. for the Italian team. The Spanish winger was voted as the best man on pitch..
New signing H. Calhanoglu made a good game, assisting at one goal last night. Montoya played his 3rd and last game for Leverkusen; will be leaving for Atletico. Shakhtar Donetsk slumped to a 3 - 0 defeat to Bayern München in their Division 1 fixture. Well, 3 internal deals completed at Porto. Now I can just proceed to getting relegated. Well' date='[b'] 3 internal deals[/b] completed at Porto. anyone up for young youth swop outs (deals)? I think that's the rules for another season moons ago mate. 3 internal deal + playing U21 / U88 for 5 match is the only one that's valid right now. Send out a PM in game Noisy and state the actual rules for this season. some managers in the gw clearly doesn't check in here regularly. The new season started with some important changes for Bayer '04 Leverkusen. in exchange for talented Dutch winger Memphis Depay (also aged 21 y.o.). 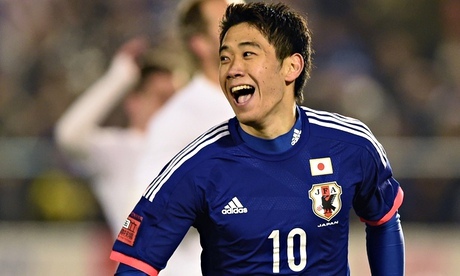 moved to Madrid in exchange for Japan international Shinji Kagawa (aged 25). as part of the Hulk - Kagawa agreement between these two clubs this week. Portuguese winger Luis Nani after leaving Japanese defender Yuto Nagatomo. Another young talent, Goncalo Guedes, left Bayer for Benfica - 1M cash deal. [Number 10] Shinji Kagawa - Leverkusen's new playmaker. Global message sent out and Opening post updated with rules. I hope there is no more confusion. Bayern München outclassed Atlético Madrid and beat them 3 - 1 in their Division 1 fixture. Lewandowski had an impressive game and was voted Man of the Match. Kroos, Robben and Ribéry were amongst the goalscorers. 3 league games and 3 wins, Mister Woods the latest victim. Could this be 3 consecutive league titles only time will tell. I am still looking to do my 3 internal deals and yes I have received offers which can only be described as derisory at best and bloody insulting at worst. We are yet to score this season. Well' date=' 3 internal deals completed at Porto. A nice win last night for Dortmund but the pleasing factor is Fischer scored the winner in his 3rd of the 5 games he has to play this season. Always a worry how it will affect your side playing the youngster but he has done really well so far and with 7 points from a possible 9 it hasn't hindered us at all. Bayer Leverkusen won their away game against Liverpool FC on Anfield Stadium. back into game after break and score 3 goals until the final whistle of the match. L. Lucas scored for the English team last night; Pedro voted as MoM (2 goals). will miss next two official matches: Atletico M. (cup) and PSG (league game). Bayer Leverkusen moved up to 2nd place in Division 2 (7 points in 3 games). The Man : Pedro Rodriguez is in excellent form this season. Can I leave Spurs for Benfica? Pure and simple the are my number 1 team, and the opportunity to have them in a competitive GW that's active is too good to turn away!